Does Sodium Make You Stay Awake? The human body needs sodium in order to function, making it one of the essential minerals. Sodium supports muscle contraction and nerve function, keeps the heart beating rhythmically and helps balance the amount of fluid in the body. The most common source of sodium is the hidden amount in processed foods, giving you more than 75 percent of your daily intake, according to the American Diabetes Association. Although sodium does not specifically function to make you stay awake, the negative effects of sodium may affect your ability to sleep. The U.S. Department of Agriculture Dietary Guidelines for Americans 2010 states that adults should consume no more than 2,300 milligrams of sodium per day and that those over the age of 51, African Americans and that those with chronic diseases like high blood pressure, diabetes and kidney disease lower their intake to 1,500 milligrams per day. This may sound like a large amount of sodium, but each teaspoon of salt contains 2,325 milligrams of sodium and the average person in the United States consumes about 3,400 milligrams of sodium per day, according to the Centers for Disease Control and Prevention. Consuming large amounts of sodium increases your risk for developing high blood pressure, known as hypertension. Salt attracts water, so increasing the amount of salt in your body increases the amount of water. The increase in water increases the volume of blood and your body must increase the blood pressure in order to propel the increased volume of blood through the body. The Centers for Disease Control and Prevention report that one in every three adults in the United States suffers from high blood pressure. Hypertension can affect your sleep and your sleep patterns can affect your blood pressure. A study published in the 2005 issue of "Circulation" confirms that sleep deprivation can contribute to high blood pressure. So although consuming sodium does not make you stay awake, consuming too much sodium and staying awake for too long can both cause an increase in blood pressure. As discussed in the previous section, consuming too much salt causes your body to retain fluid. The increased amount of fluid in your body can contribute to sleep disturbances that leave you feeling tired and not well rested in the morning. When you lie down to sleep, the excess fluid in the body can settle in the upper airway. This fluid in and around the airway can obstruct the pharynx and cause sleep apnea. Sleep apnea is a sleep disorder characterized by shallow breathing or pauses in breath during sleep. Patients with sleep apnea experience multiple interruptions in their sleep, making the quality of their sleep poor and leaving them as tired as if they had stayed awake. Because sodium can affect your body in so many ways, including increasing your blood pressure and affecting your sleep, take steps to reduce your intake. 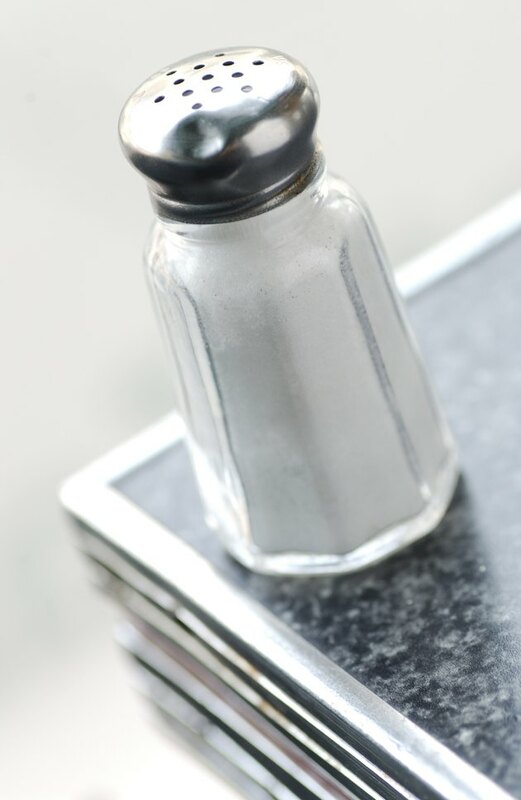 Removing the salt shaker from your table may not be enough. The majority of sodium in your diet likely comes from processed and prepared foods, so reducing your intake requires you to read food labels carefully and become aware of ingredients that contain sodium. Eat more fresh foods, use herbs and spices for flavor and use fewer condiments like ketchup, mustard and soy sauce.